I wanted to get some real early morning shots today but after I woke up I had to do a few things before I could get out. So by the time I got out it was starting to get really dark as there was a storm brewing and there was not enough light for photos. The rain started bucketing down so I had to shelter in the warung where I was having breakfast of rice and vegetables and tofu with a chaser of teh tarik. It rained for ages and when it finally eased a bit I headed down to the bus stop and photographed some people walking by and this bus controller dude reading the newspaper. Then I walked down to the local Chinese restaurant and just hung around watching them chop up ducks and chicken for a while. Then I walked past the Pasar Seni where most of the outside stalls were closed up because of the rain. After that, I just went back to the hostel and took the rest of these photos from the roof. 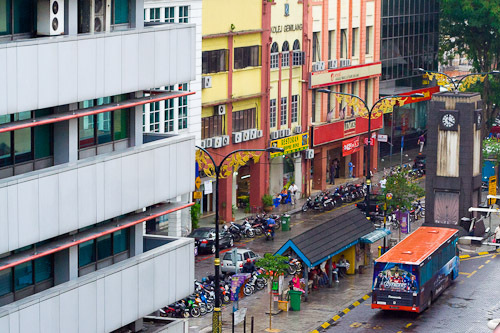 This is the Medan Pasar Bus Stop, just up the river from the Pasar Seni. It is a colourful little square with morning newspaper sellers sorting out all their papers before heading off to their spots in the city. 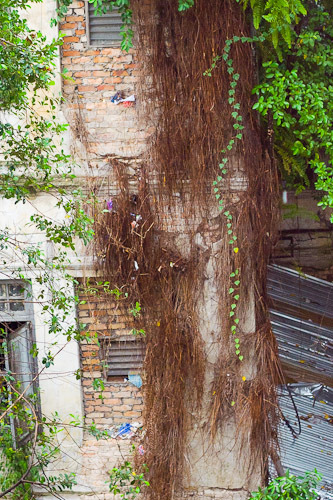 This is an old derelict building behind the hostel. 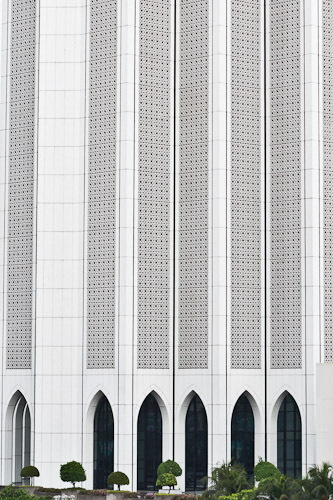 Kuala Lumpur has a lot of old falling down bits and pieces. The pavements are mostly higgledy-piggledy with holes all over the place and anything old is just falling apart. Maintenance is a dirty word here. It took me ages to find the number ten bus going to PCB. I asked about three people until I found it. That is pretty normal in Malaysia. Sooner or later you get to where you want to go. Usually after a whole slew of dodgy directions. The bus ride to the beach cost me a whole Rm1.70. This one is a female. I had to look through all the other female sunbirds with yellow fronts, for example: Brown-throated Sunbird and Purple Sunbird. Here she is standing still. There were quite a few of them in the pine trees along the beach. I went along the beach for a while until I came to a river and a kampung, a fishing village on the side of the river. 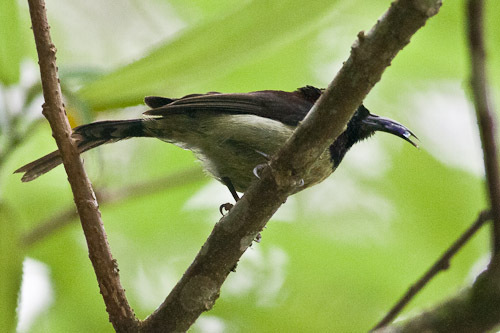 The thing that settled it for that they were Olive-backed Sunbirds was this eclipse male with the start of a black streak down his chin. He dribbles a bit, see? I also missed getting a shot of a Black-crowned Night-Heron, which I thought might have been a Little Heron. I surprised him on the banks of the river and he took off before I could get a decent shot of him. He even had a fish in his beak. doh! Not sure what this is, but it is pretty young. It was whingeing for ages. There have been Oriental Reed Warblers and Black-browed reed Warblers seen in this area but I do not think it is one of them. I really have no idea to be honest. I went back to the railway line this morning. It turned out pretty good with a couple of new birds that I had not photographed before, so it was a good morning. I only went out for an hour or so because I had to catch the jungle train to Khota Baru. 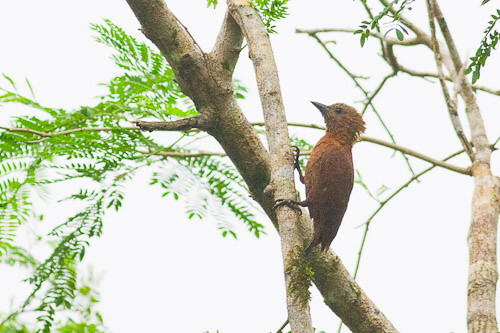 The Rufous Woodpecker, (Micropternus brachyurus) is a brown woodpecker that builds its nest inside an acrobats ants nest. It used to be placed in genus Celeus, but it has no DNA link with the other South American woodpeckers, but is monotypic. This photo shows the striations the back a bit better. 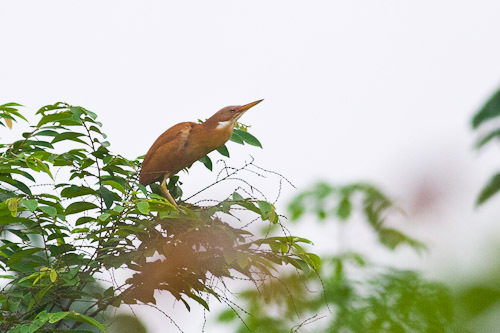 Cinnamon Bittern breed in Asia from Pakistan to China and Indonesia. Their habitat is reed-beds and they feed on insects, fish and amphibians. This one seems to be a male as far as I can tell. 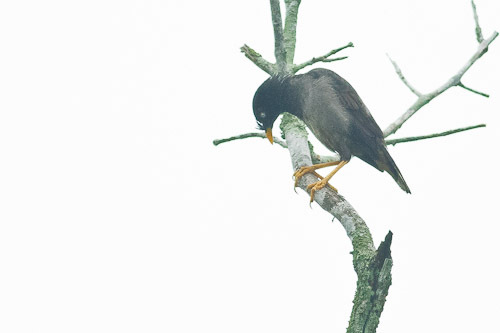 I am pretty sure this is a juvenile Jungle Myna. It is difficult to know which is which sometimes. For once I was up early and over the river before eight o’clock. It was still a bit dark, so I was not real optimistic about getting much decent photos. I headed to the grassy patch where Ron had told me that the Crested Firebacks might be. One of the park officials asked me where I was going and I said I was looking for the big birds. He directed me to the camping area. As soon as I got over the hill, I saw the big birds and they scattered into the jungle. I sat down and waited for a while and they came out again. There still was not enough light for me so I used the flash. At least I got a few record shots for this bird. 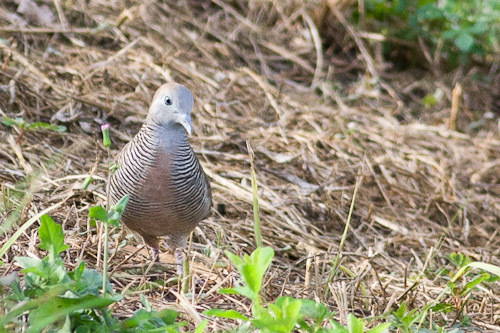 I also got a shot of the female which is all grey-brown except for a blue eye patch like the male. That was that for the Taman Negara. I crossed back over then river, had a shower, and headed off to the bus stop. The bus was nearly an hour early. Man, this place is so random. I never know what is going on. doh! Anyhow, I got to Jerantut and in the afternoon went for a walk near the railway station (Stesen Keretapi). 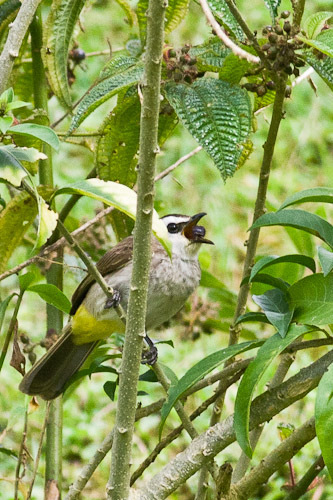 This Yellow-vented Bulbul has got real attitude. They just keep on doing all the winning poses. These birds must be the most photogenic on the planet. I was just walking along the train track when I heard this squwarking up in the sky, so I turned around at whatever was flying past. 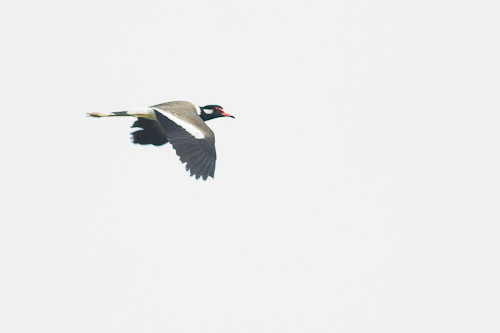 It was a Red-wattled Lapwing. That was cool. I wanted to get a photo of a lapwing in South-east Asia. There are a couple more species so hopefully I will bag the lot of them! 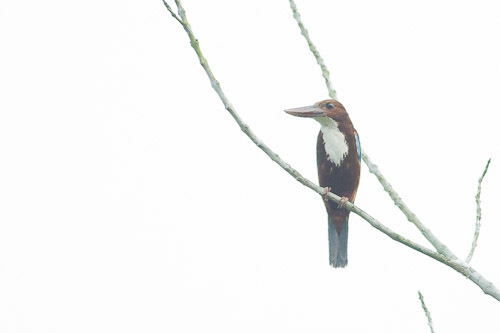 White-throated Kingfishers are quite common around here. They seem to pop up everywhere. Either that or it is the same one following me around. 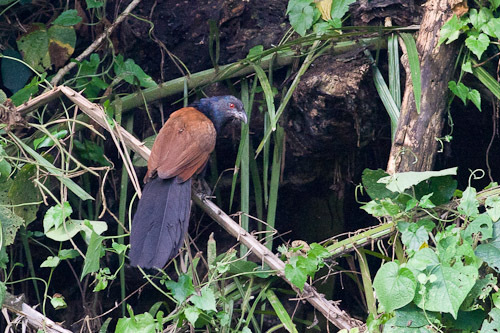 I had taken a photo of a Greater Coucal early in the morning with the firebacks but this photo from later in the day at Jerantut is much better. He looks very angry. 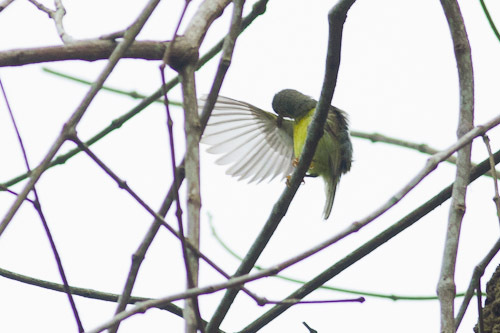 Burung marah. As opposed to this “Peaceful Dove”. I did a big close up on this one to show the stripes on the chest. It is my third day in the jungle. Well, to be honest, it is pretty much a tourist resort. Especially today being a Saturday and there are hordes of tourists pouring across the river to explore the jungle. I got up late again. It must be the heat – it is so exhausting. You sweat constantly and it is so humid. I stopped at the tree again this morning and there were heaps of birds feeding on the seeds again. This is a female as it is a turquoise colour with black on the wings, almost the opposite of the male which I photographed yesterday. 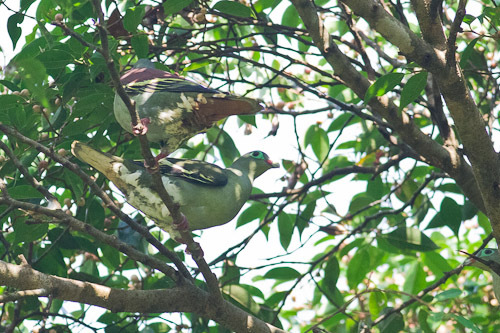 This is a male and female pair of Thick-billed Green-Pigeon. 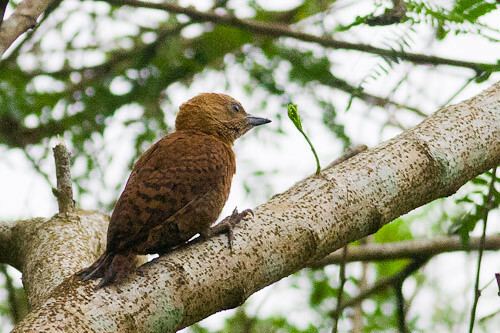 Note that the male on the left has brownish under the tail and the female has white and the male has the reddish-brown patch on the wing. After the tree, I went down to the swamp, hoping for some birds along the edges, but there was nothing doing. But there were heaps of butterflies flittering around in the grass. 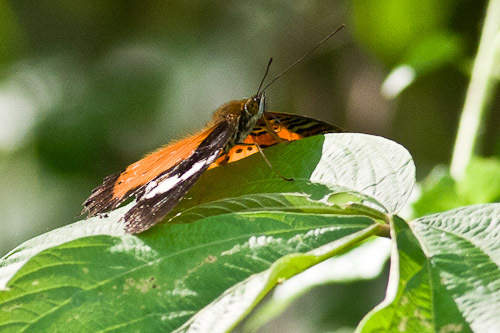 This one looks a lot like a Monarch Butterfly, but probably isn’t. Its wings were very battered. 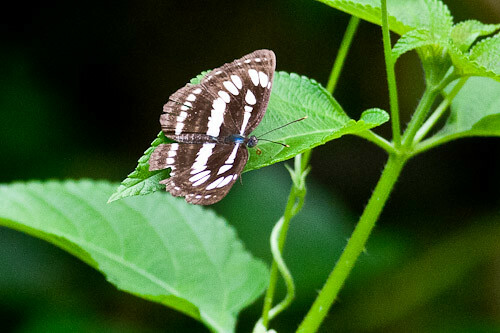 This is a very plain-looking black and white butterfly. I could not get over how silky and furry this brown beauty was. 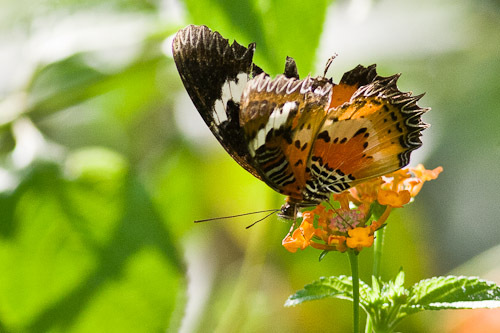 I really love the texture of this gorgeous butterfly. A late start for me. I did not get out of bed until 8 or so. I was dog-tired and the trekkers were playing music till late at night. So, after an unusual western meal of toast and eggs and coffee, I headed over the river to the National Park. 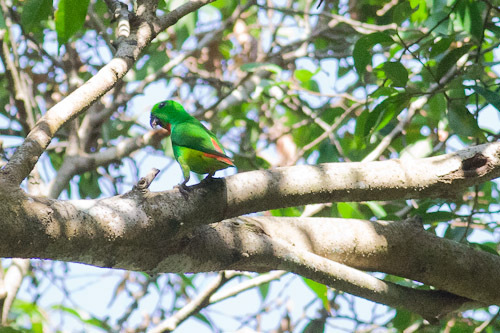 I met some bird photographers from Singapore and I traipsed along with them. Inside the park resort where all the bungalows are, we spotted a whole heap of birds in this tree. I thought this one was a Pink-necked at first but it wasn’t. 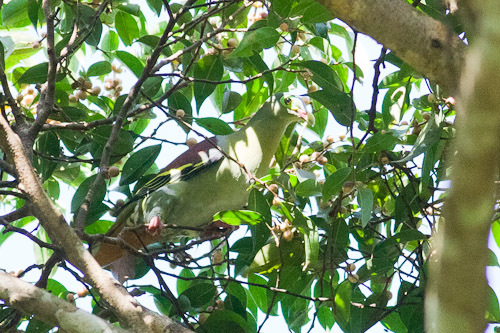 And another species of Green-Pigeon came feeding in the same tree. We stayed there for ages. 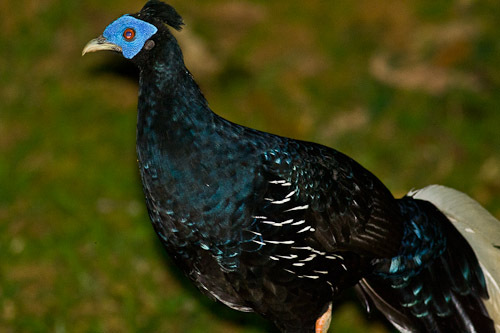 This bird is really bizarre as it has a flat blue bill. Weird, hey? And yet another extreme-looking bird. 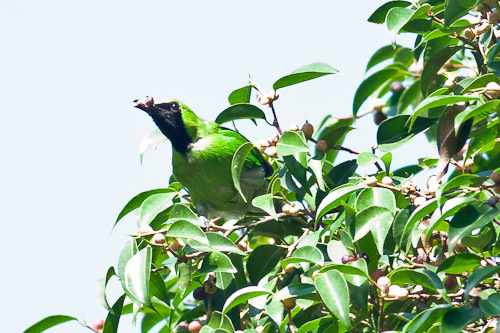 This one was a Greater Green Leafbird. Good for hiding in trees. And still in the same tree, I could not believe my eyes when I had a look at this photo. Hey, its a parrot, I said. 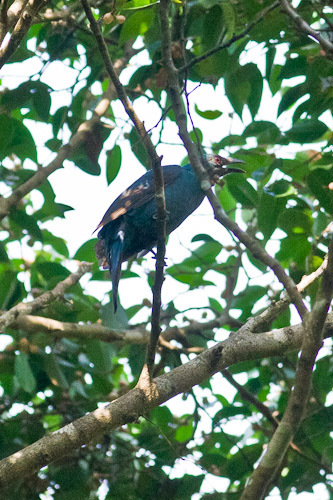 First one I have seen in South-asia so far. And yet another striking looking bird. Still at the tree. Have not moved out of the resort yet. Finally we moved into the jungle and Ron pulled out his music player and started playing bird calls to bring in the babblers. A few came along but my camera could not get a picture. I can only get up to ISO1600 and an aperture of f/5.6. Totally inadequate for the under-storey of a rainforest. Luckily this one moved out into the sunlight for me. Thanks. On the way back, I spotted this woodpecker. At first I thought it was a flameback, but no. It did not have the black stripes on the face. All in all, it was a good day’s birding for me as I photographed 8 new species. But photographically, it was pretty ordinary. Today’s photos I would classify as record shots only, except maybe for the spiderhunter one. I rescued that quite well. It has been a long day. We started off at 8am this morning from Cameron Highlands and drove towards Kuala Lipis and the river that leads to the Taman Negara at the jetty at Kuala Temberling. While I was waiting for the boat to the jungle, I took a few photos. 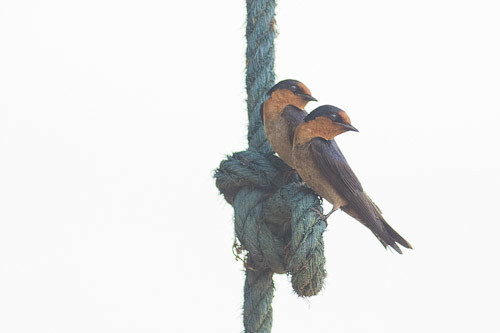 These pair of Pacific Swallow were hanging on to a rope that was mooring the boat. There were a few birds in a tree where we were waiting. 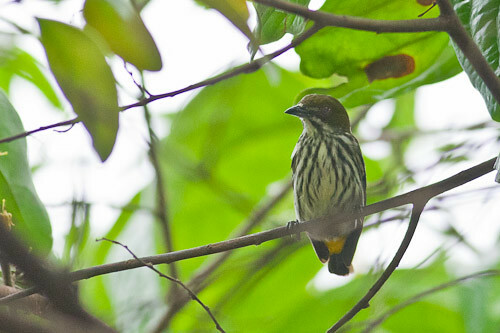 This Yellow-vented Flowerpecker was flittering around in the tree above me. I am not sure what sunbird this is. 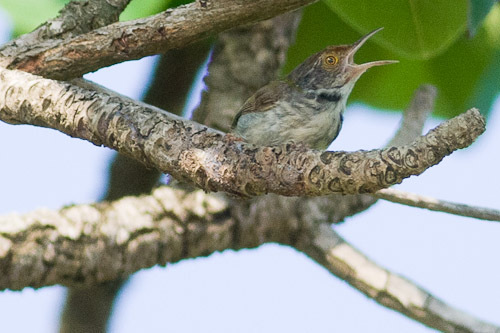 I am torn between three of them – Brown-throated Sunbird, Red-throated Sunbird or Olive-backed Sunbird. To compound my confusion it could be a male in eclipse. We finally got going in the boat which took about three hours to get there. 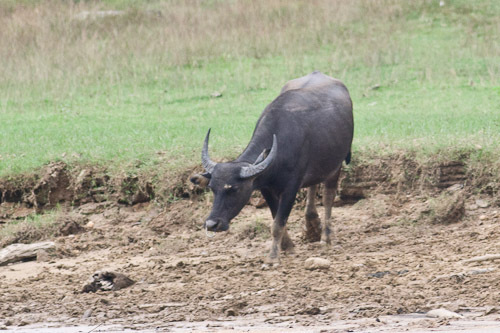 We saw a few Water Buffalo along the way and managed to ground the boat on a sand-bank. We all had to get out and push it off again. 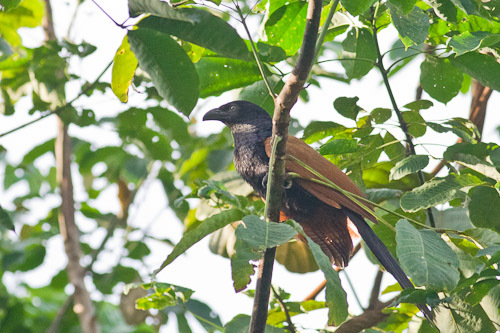 While I was looking for a hostel at Kuala Tahan, I came across two Greater Coucal along a track to a Guest House. Hutan Lipur, Tanah Rata. 120516. I was going to go to Robinson Waterfall this morning but I just decided to go back to the Parit Falls track. I started off at the garden opposite the bus station again. There were no sunbirds flitting around the flowers, which I was hoping for. 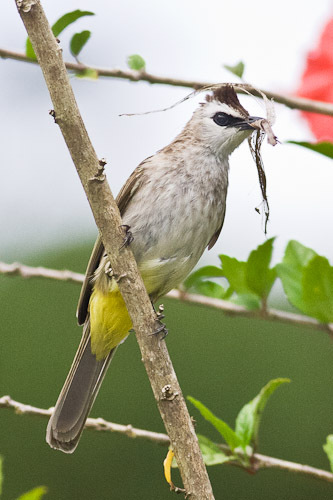 But there was a Yellow-vented Bulbul flying around with sticks in his beak. He would land on this branch and then dart into a clump of palms when he thought I was not looking. Later on in the afternoon, I caught this one having a feed on these berries in the garden. I took a photo of this Tailed Judy again today. This time I used the in-built flash and it turned out all right, I reckon. I used the flash a fair bit today. Mainly because it was so dark in the rain-forest under-storey. 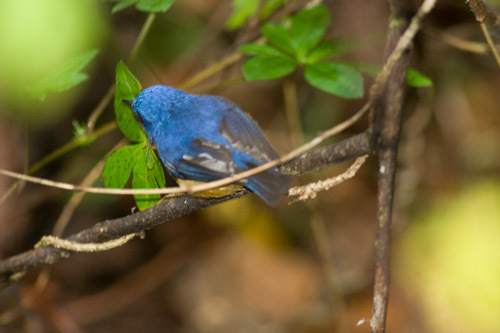 Is this a Pygmy Blue Flycatcher or Hill Blue Flycatcher (Cyornis banyumas) ? 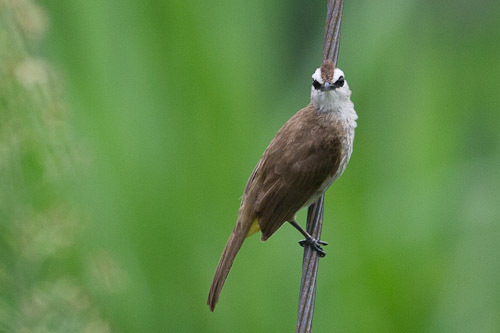 Or even a rufous-vented niltava? I think it was too small to be a Hill Blue Flycatcher but it is claimed that the Pygmy Blue Flycatcher have not been seen for a while. 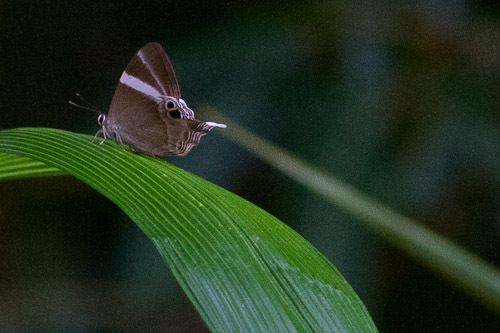 But they have been seen in the Genting Highlands. 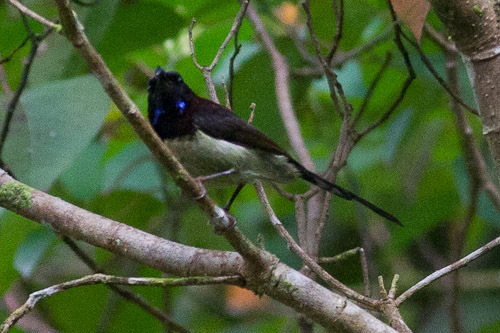 And the Hill Blue Flycatcher is seen at Bukit Fraser and Cameron Highlands. 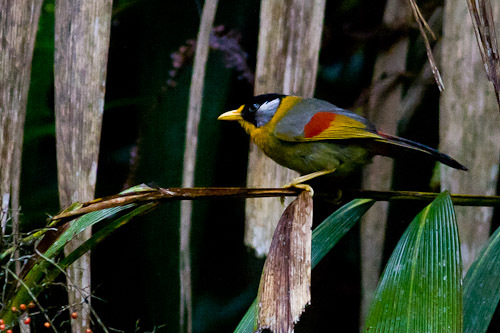 There was a flock of Silver-eared Mesia near the waterfall. 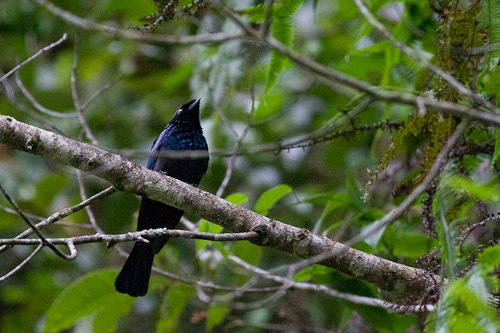 At first I thought it was a black drongo, but it did not have the forked tail. 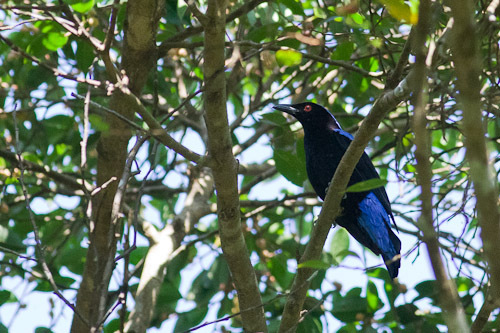 Then I thought it might be a Blue Whistling-Thrush, but it had a black beak. 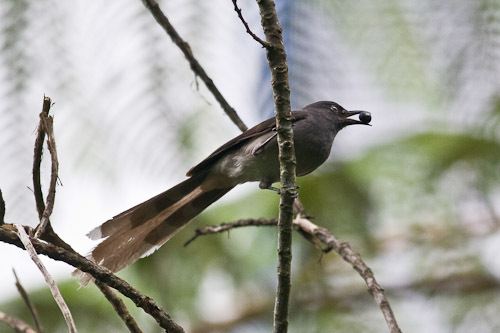 Then I saw a photo of a lesser racket-tailed drongo without the racket and it looked pretty similar, so I am going with that.. Update: it was a Lesser Racket-tailed Drongo, thanks mr tou. 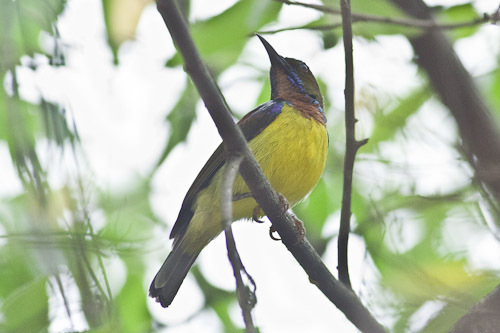 Mystery Black-throated Sunbird (Aethopyga saturata). I have got no idea what this is. 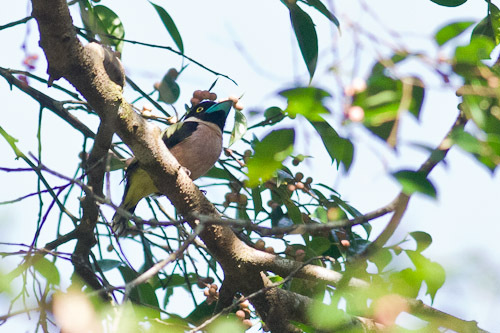 I am pretty sure it is some kind of sunbird or similar but I could not find it in Robson or on the internet. 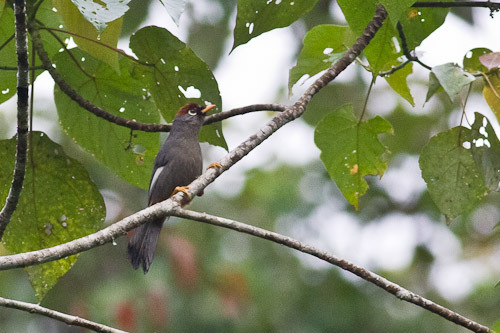 At first I thought it might be a Dark-backed Sibia (Malacias melanoleucus) but no. Mystery bird front on Black-throated Sunbird (Aethopyga saturata). 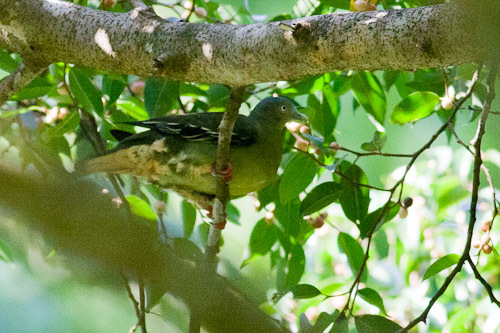 Here is a really bad front on shot that shows 2 blue spots on the neck of this bird. That may help identify it. I think I shall have to ask the local experts. 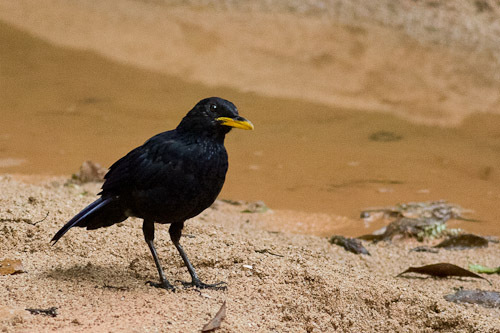 I saw this Blue Whistling-Thrush on the beach below the Parit Falls. I had been trying to get a photo of these birds all morning. They had been flying over me and hiding in the trees, so I was getting really frustrated with them. Finally on the way home, I got some decent shots of them on the track just before where it ended. doh! This one is a juvenile with the light grey speckled chest. Parit and Robinson Falls. 120515. I tried the same route as yesterday afternoon this morning. First the garden, then up along the track to Parit Falls. 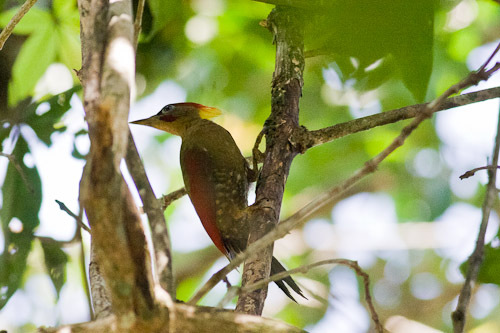 There was not much in the garden but there were a few birds in the forest near the Parit Falls. This one took a bit of working out but I googled birds and Cameron Highlands and found the answer. 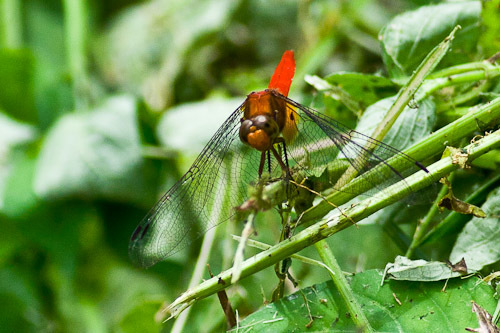 There were a flock of about a dozen of these, flitting from bush to bush. I am not even going to attempt to ID this one. I will leave it till tomorrow. 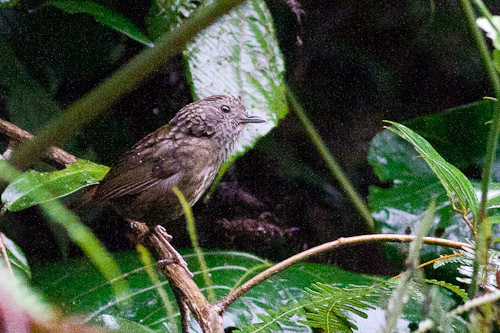 Update: It is a Streaked Wren-babbler (Napothera brevicaudata), thanks to Mr Tou for the identification. 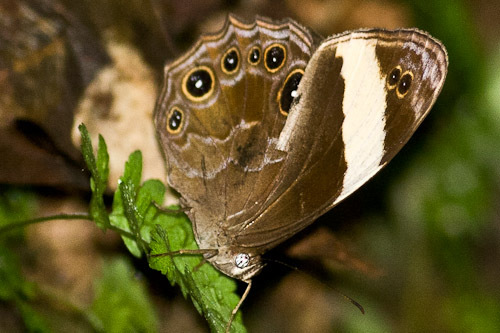 This butterfly looks back to front because he has what looks like an eye at his rear end. 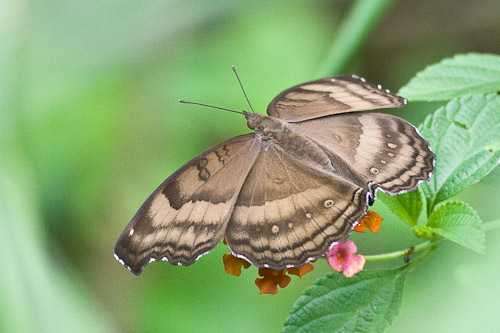 Update: Tailed Judy (Abisara neophron) butterfly, ID by Ma’ruf – thank you. 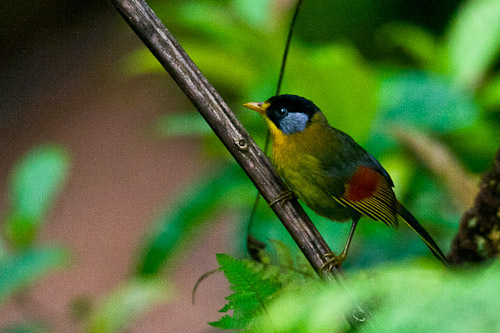 They are found through Myanmar, Thailand, Laos, Vietnam, S.China and Malay Peninsula. 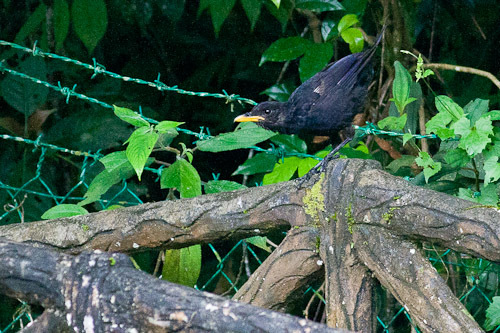 I thought this was a Chinese Blackbird at first glance but the slight hook in the beak had me suspicious. Once again Google came to the rescue and I found some people who had done banding on these birds. Parit Falls walk, Tanah Rata. The bus ride from Kuala Lumpur to Tanah Rata in the Cameron Highlands took about four hours and was pretty eventless. The bus was air-conditioned a little bit too well and everybody was freezing. I was going out in the afternoon to photograph some birds but it started pouring rain. Later on about five o’clock it stopped so I headed out. It was overcast and dark still, so the light was pretty rotten. 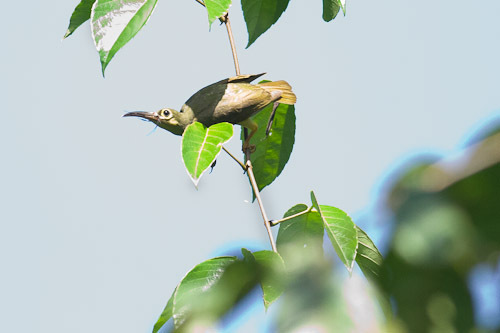 I photographed a sunbird and I am trying to identify it. I might go through the process to show how I work out what is what. 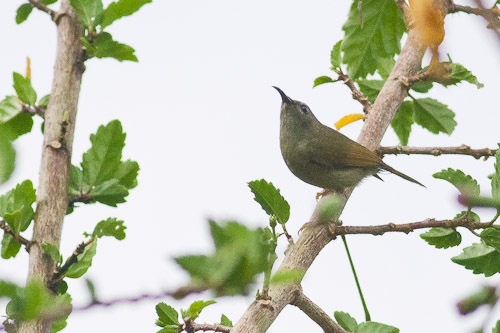 From Robson’s book I made a first stab at it being either a female Crimson or Temminck’s Sunbird. 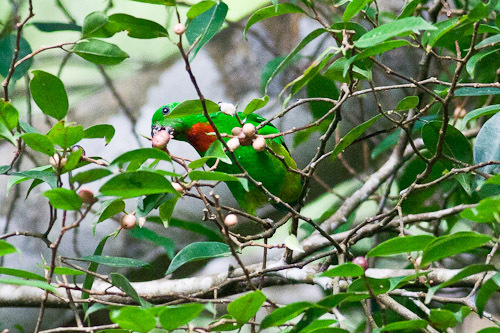 Then I did a search on google for “sunbird cameron highlands” and found a similar bird that need identifying as well. 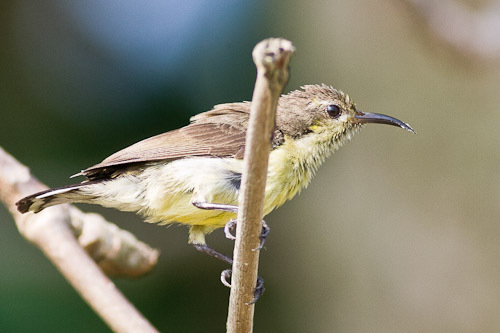 Someone suggested a young/female Black-throated Sunbird. So I added that to the list. 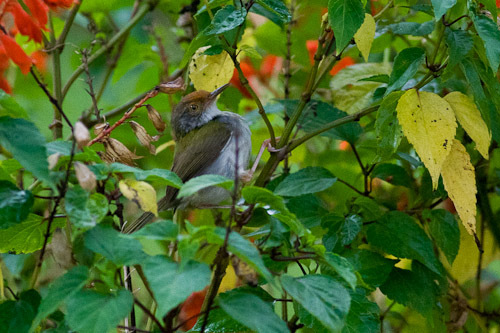 And the Black-throated has been seen in this area so it is a strong contender. 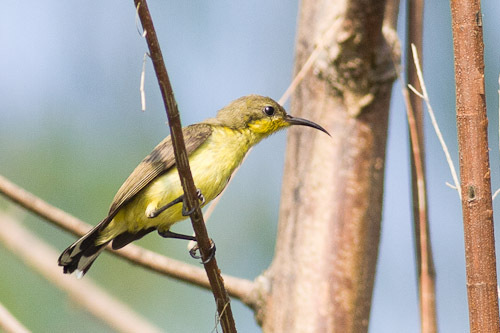 And I will go with female Black-throated Sunbird. There were quite a few little birds feeding on the flowers in a park just before the start of the Parit Falls walk. 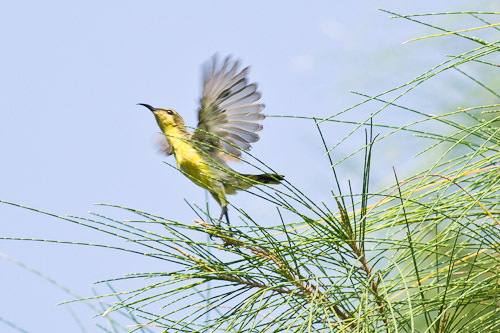 Earlier on I saw a Purple Sunbird by the side of the road, not more than 3 or 4 meters from me. But of course I had no camera with me. A lesson to be learnt there, perhaps? The track to the waterfall was not much. 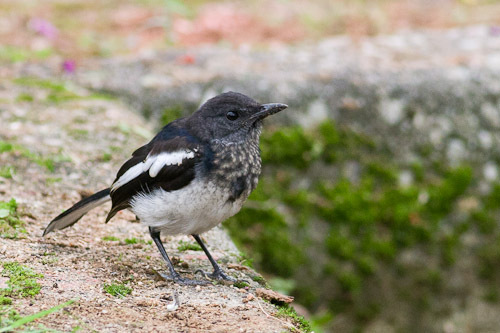 There was a few Oriental Magpie-Robin of course and some birds late in the afternoon when the light was so bad that my photos were all dark. I just bumped these photos up a couple of stops and the results are unusable.